Tag line: "We're taking all the fun out of life - and putting it into a movie!" I remember our hopes were high as my father, brother and I walked into the theater to see Easy Money back in 1983. 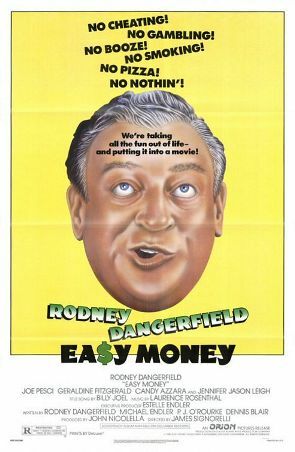 Not only was it the first movie to feature Rodney Dangerfield since 1980’s Caddyshack, but this time around he had top billing all to himself, and we were anxious to see what the comedian would do with it. For the most part, we were pleased with the film; Easy Money definitely made us laugh. But even then, we kinda felt Dangerfield could do better. Monty Capuletti (Dangerfield) is a working class slob, a professional baby photographer who drinks too much, smokes too much, gambles too much, and does more than his share of drugs. Yet, despite all his flaws, Monty’s wife Rose (Candice Azzara) loves him. The same cannot be said, however, for his mother-in-law, Mrs. Monahan (Geraldine Fitzgerald), the owner of Monahan’s department store and a very wealthy woman. While iattending the wedding of Monty’s and Rose’s daughter Allison (Jennifer Jason Leigh), who marries a feisty Latino named Julio (Taylor Negron), Mrs. Monahan chastises Monty for his excesses, and laments the fact that Rose didn’t end up with someone else. Then, a few weeks later, tragedy strikes: Mrs. Monahan is killed in a plane crash. During the reading of the will, her lawyer Scrappleton (Tom Ewell), announces that the Monahan fortune, totaling $10 million dollars, has been left to Rose and her family. But there’s a stipulation in the will that may make it impossible for them to collect: Monty must give up cigarettes, alcohol, and drugs for 12 months, and lose weight in the process. Should he fail to do so, Mrs. Monahan’s nephew Clive (Jeffrey Jones), who acted as her personal assistant, will receive the inheritance. With the help of his younger daughter Belinda (Lili Haydn), and the support of his friends Nicky (Joe Pesci), Louie (Val Avery) and Paddy (Tom Noonan), Monty does his best to control his urges, but can he really give up all the things he loves for an entire year? Dangerfield, whose self-effacing stand-up routines had been entertaining people for decades, was a natural choice for the role of Monty Capuletti, an everyman who, at first glance, seems to have more vices than virtues. And, as expected, the film’s biggest laughs come courtesy of its star; the extended sequence where Monty and Nicky drive around town with Allison’s wedding cake in the back of a van, making stops at the bar, a race track, and a crap game along the way, is a hoot, as is the scene where the two pals pay a visit (for the first time ever) to Monahan’s department store, where they stick out like a sore thumb (“Hey, we’re browsing!”). In addition, a side story involving the marital woes that Allison and Julio are experiencing (which start on their wedding night) is good for a few chuckles; and the exchanges between Monty and his mother-in-law (a character very similar to the one Geraldine Fitzgerald portrayed two years earlier in Arthur) give Dangerfield a chance to deliver some of his patented one-liners (when she criticizes his smoking and drinking, calling him an “ecological menace”, Monty shoots back “Yeah, well you were the inspiration for twin beds!”). Yet as good as it is at times, Easy Money should have been funnier. Though not yet a household name in 1983, Joe Pesci’s character is still underutilized (those scenes in which he is featured are among the film’s best), and while Jeffrey Jones’ Clive does try on a couple of occasions to trip Monty up so that he can inherit the fortune himself (at one point, he has 8 pizzas delivered to Monty’s house, in the hopes it will ruin his diet), this is yet another avenue ripe for laughs that is never fully explored. As for Rodney, he does what he can with the part, but falls short of the comedic insanity he unleashed as the wisecracking Al Czervik in Caddyshack. In my opinion, Dangerfield’s best starring role came in 1986’s Back to School, which allowed the comedian to cut loose in a way he never does here. Still, as a showcase for his style of humor, Easy Money has its moments, and just enough of them to make it a fun movie to watch. Ah one of Dangerfield's lesser known titles. He was definitely a one of a kind comedian, we'll never another like him. Regarding EASY MONEY- We've seen this plot come and go many times ever since, for instance, there's Eddie Murphy in TRADING PLACES and Richard Pryor in BREWSTER'S MILLIONS.